Since January 2017, Artemis Interiors has built a close relationship with Langham Oaks, a specialist school based in Essex which provides support for boys aged between 10-16 years old who face behavioural, emotional, social and mental health challenges. 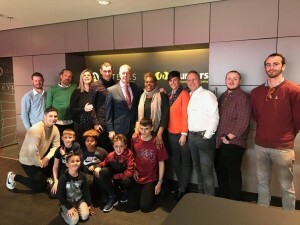 The partnership with Langham Oaks has given the boys an opportunity to attend Artemis organised events and an unforgettable experience in meeting all time football legend Sir Geoff Hurst. From the company’s perspective, it has allowed Tony Martin (Managing Director) and Shirley McArdle (Business Development Manager) to engage with, and support the boys in school events, and we are proud to have recently sponsored an award for Sports Achiever of the Year, and also attended the much-coveted Langham Oaks Sports Day, a fun-filled day for everyone who attended and took part. “Langham Oaks School are delighted to have formed a new partnership with Artemis and Hunters.This new opportunity will help to further motivate these very complex and challenging young people by providing them with a range of experiences (both work-based and social) to support them in their learning”.